Episode #159: Superman 2010: The Year In Review! This is the third year in review episode. I discuss the NEW KRYPTON storyline that wrapped up, and the GROUNDED plot that began this year. Also highlighted were the mini-series SUPERMAN: SECRET ORIGIN and SUPERMAN: LAST FAMILY OF KRYPTON. Then I share what's in the plans for the SUPERMAN FAN PODCAST for 2011. And I give my vote for the best Superman story of the year. Next episode: THE SEARCH FOR THE SILVER AGE SUPERMAN! Episode #158: Metropolis Mailbag: Superman #64! 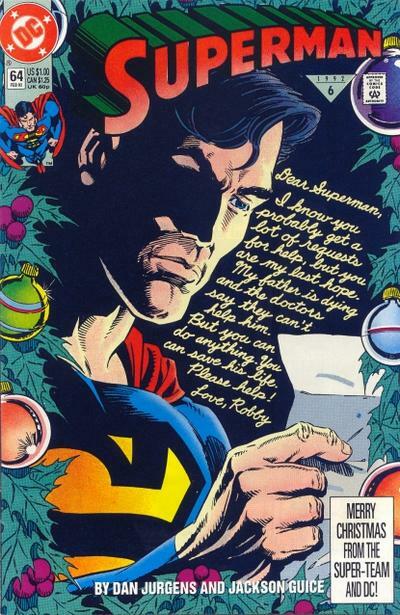 For the third annual Superman Christmas episode, the featured story is METROPOLIS MAILBAG, from SUPERMAN 64, February 1992, published on December 17, 1991 (the very day my daughter was born). METROPOLIS MAILBAG (which was also the name of the long running letter column in the SUPERMAN title) was written by Dan Jurgens, drawn by Jackson (now Butch) Guice, lettered by John Costanza and colored by Glenn Whitmore. The assistant editor was Dan Thorsland, and Mike Carlin was the editor. The cover was pencilled by Dan Jurgens and inked by Brett Breeding. It turns out that Santa Claus isn't the only one who gets mail from around the world. Next Episode: SUPERMAN 2010: THE YEAR IN REVIEW! Coming to the podcast airwaves in January 2011: THE THRILLING ADVENTURES OF SUPERMAN podcast, hosted by Michael Bradley, who has written to this podcast. At the end of this episode you can hear a promo for his new podcast. Check it out at http://www.greatkrypton.com/ . SUPERMAN FAN PODCAST is a proud member of the LEAGUE OF COMIC BOOK PODCASTERS at http://www.comicbooknoise.com/league and the COMICS PODCAST NETWORK! http://www.comicspodcasts.com/, and is now a proud member of the SUPERMAN WEBRING of websites, and is one of the founding members of the SUPERMAN PODCAST NETWORK at http://www.supermanpodcastnetwork.com/ ! Episode #157: Happy Birthday, Al Plastino! 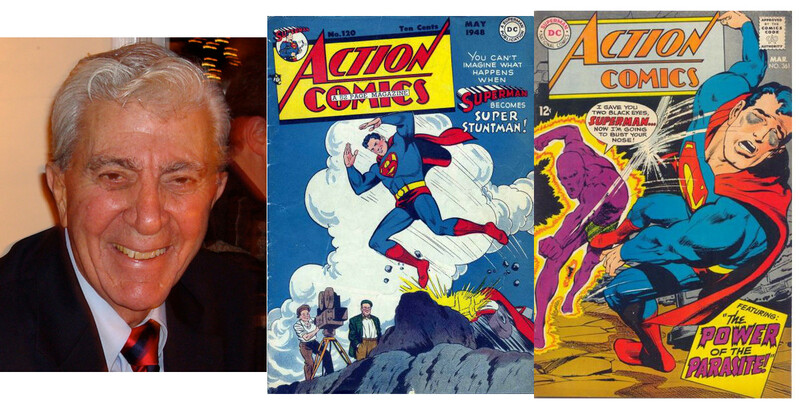 (L to R:) Al Plastino, Action Comics 120, May 1948 & Action Comics 361, March 1968! - ACTION COMICS 120, May 1948, published around March 19, 1948. SUPERMAN, STUNT MAN was written by Alvin Schwartz. - ACTION COMICS 361, March 1968, published on January 30, 1968. THE POWER OF THE PARASITE was written by Jim Shooter. 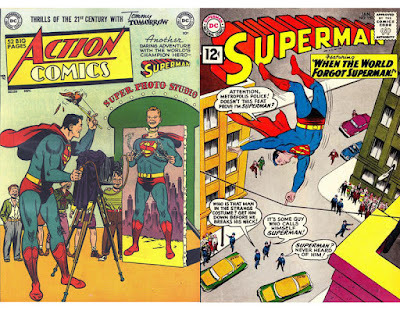 (L to R:) Action Comics 481, March 1978 & Action Comics 482, April 1978! During this holiday season, I thought it would be the perfect time to highlight the only appearance of the Supermobile. Before the era of action figures with multiple accessories, the two issues that the Supermobile appeared in were fun action stories. And what red blooded American man or woman wouldn't want to get a Supermobile for Christmas? Built of Supermanium, the hardest metal known to man, impervious to fading, denting or scratching, with an interior equipped with everything a driver needs to duplicate Superman's powers, the Supermobile is the perfect gift for anyone's stocking stuffer. The Supermobile can travel on or off-road, as well as underwater, in the air and in outer space. And the fuel mileage is infinity, which can't be beat! - ACTION COMICS 481, March 1978, published on December 26, 1977 (during my senior year of high school). Julius Schwartz was the editor, and the cover was drawn by Jose Luis Garcia-Lopez. IT'S A BIRD ... IT'S A PLANE ... IT'S SUPERMOBILE was written by Cary Bates, pencilled by Curt Swan, inked by Frank Chiarmonte, lettered by Jean Simek and colored by Gene D'Angelo. - ACTION COMICS 482, April 1978, was published on January 30, 1978. THIS IS A JOB FOR SUPERMOBILE! was done by the same creative team who did issue 481. This story had no reprint information available. These two issues were the middle installments of a four issue storyline which began with ACTION COMICS 480 and ended with issue 483, involving the villain Amazo, who I briefly summarize his creation and abilities. Next Episode: HAPPY BIRTHDAY, AL PLASTINO! (Top L to R:) Superman 87, March 1994 & Superman 88, April 1994! 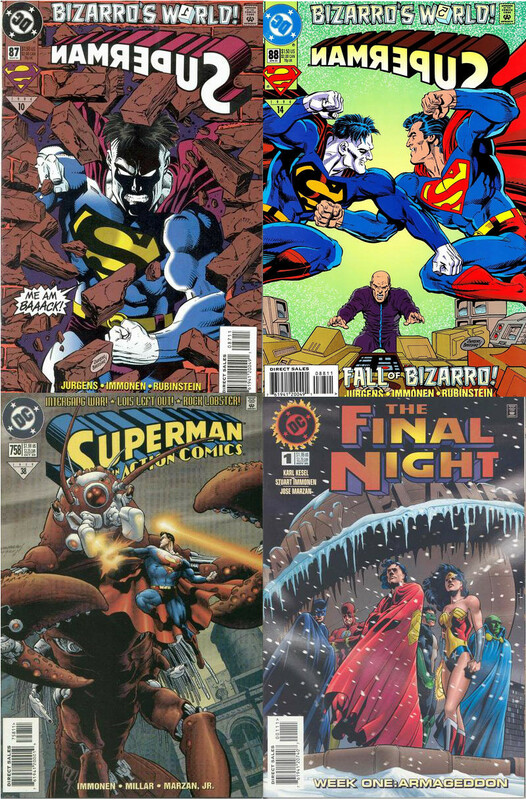 (Bottom L to R:) Action Comics 758, October 1999 & The Final Night 1 (of 4), all November 1996! Stuart Immonen has had a long career as a comic book artist and writer. His wife Kathryn also works in the industry as a writer. Stuart studied art at York University in Toronto. His first comic book work was the self published series PLAYGROUND. Stuart began working for DC Comics and Marvel in 1993. I was first exposed to Stuarts art on the title THE LEGION OF SUPER-HEROES (vol. IV, better known as the "5 Years Later Legion"), beginning with issue 39, January 1993. He stayed on the title through issues 61 and 0 (a ZERO HOUR tie-in) and LEGIONNAIRES 10, January 1994. - SUPERMAN 87 and 88, March and April 1994. - THE ADVENTURES OF SUPERMAN 520, February 1995 - 550, September 1997. - Stuart contributed art for SUPERMAN; THE WEDDING ALBUM, December 1996. - ACTION COMICS 738, October 1997 - 758, October 1999. He also wrote and pencilled SUPERMAN: END OF THE CENTURY in 2000. He also did two webcomics: NEVER AS BAD AS YOU THINK and MOVING PICTURES, which took place during WWII and had the Nazi theft of Europe's art treasures as a backdrop. MOVING PICTURES was published in a softcover by Top Shelf Productions during the summer of 2010. - SUPERMAN 87 and 88, parts I and V of the 5 issue BIZARRO'S WORLD storyline that crossed over the Superman titles cover dated March and part of April 1994. - FINAL NIGHT, a four part miniseries that crossed over the entire DC Universe. It brought back the classic Legion nemesis Sun Eater to threaten Earth's Sun. It was published weekly, carrying the cover date of November 1996, and was published in September of that year. SUPERMAN FAN PODCAST is a proud member of the LEAGUE OF COMIC BOOK PODCASTERS at http://www.comicbooknoise.com/league and the COMICS PODCAST NETWORK! http://www.comicspodcasts.com/, and is now a proud member of the SUPERMAN WEBRING of websites. Episode #154: Happy Birthday, Keith Giffen! 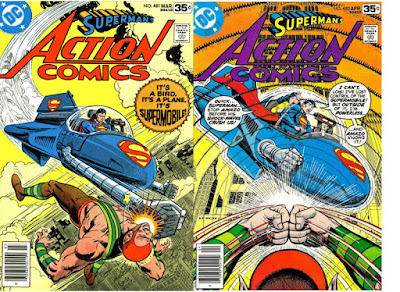 (Top L to R:) Action Comics 577, March 1986 & Action Comics 579, May 1986! (Bottom L to R:) Action Comics 646, October 1989 & Superman: The Man Of Steel 15, September 1992! Before featuring Keith Giffen I mention a few things I'm thankful for this Thanksgiving holiday, including my listeners. Keith Giffen was born on November 30, 1952 in Queens, New York City. He is a comic book artist and writer who has created a wide variety of comic book stories for many publishers. Giffen has worked for independent publishers as well as industry giants DC Comics and Marvel. He is most famous for two separate runs as artist and plotter on LEGION OF SUPER-HEROES, and as writer on JUSTICE LEAGUE INTERNATIONAL and JUSTICE LEAGUE EUROPE. Keith Giffen has also created the humorous character Ambush Bug, who is a vehicle for Giffen to satirize the conventions of super hero comic books. In 2010 Giffen wrote the 12 issue mini-series THE AUTHORITY: THE LOST YEARS, as well as the titles BOOSTER GOLD and DOOM PATROL. He has drawn a handful of Superman stories, and his work on the Legion, for whom the Man of Steel served as inspiration, makes him an interesting subject of this episode. - DC COMICS PRESENTS #81, May 1985. ALL THIS AND KOBRA TOO! was scripted by Robert Loren Fleming, with Keith Giffen serving as plotter/penciller. Bob Oksner was the inker, the letterer was Bill Pearson, and the colorist was Anthony Tollin. - DC COMICS PRESENTS #88, December 1985. PROPHECY OF THE DEMON was written by Steve Englehart, pencilled by Keith Giffen, inked by Karl Kessel, lettered by Albert DeGuzman and colored by Gene D'Angelo. - WORLD'S FINEST COMICS #322, December 1985. THE SEARCH ws written by Dwight John Zimmerman, pencilled by Keith Giffen, inked by Karl Kessel, lettered by Duncan Andrews and colored by Nansi Hoolahan. - ACTION COMICS #577, March 1986, published on December 19, 1985. The editor was Julius Schwartz. The cover was pencilled by Keith Giffen and inked by Bob Oksner. CAITIFF: FIRST OF THE VAMPIRES was plotted and pencilled by Keith Giffen and scripted by Robert Loren Fleming. Bob Oksner was the inker, Gene D'Angelo the colorist and Milt Snapinn the letterer. - ACTION COMICS #579, May 1986, published on February 27, 1986. Julius Schwartz was still the editor, and the issue contained 32 pages for the cover price of 75 cents. The cover was pencilled by Keith Giffen and inked by Karl Kessel. PRISONERS OF TIME was written by Randy and Jean Marc Lofficer, pencilled by Keith Giffen, inked by Kark Kessel, inked by Bob Oksner, lettered by Milton Snapinn and colored by Gene D'Angelo. - ACTION COMICS #646, October 1989, published on September 5, 1989. The editor was Mike Carlin, and the issue contained 32 pages, still for the cover price of 75 cents. The cover was drawn by George Perez. BURIAL GROUND was scripted by Roger Stern, plotted and pencilled by Keith Giffen, inked by Dennis Janke, lettered by Bill Oakley and colored by Glenn Whitmore. - SUPERMAN: THE MAN OF STEEL #15 (Triangle # 1992: 13) September 1992, was published on July 14, 1992. The issue contained 32 pages for $1.25. The editor was still Mike Carlin, and the cover was pencilled by Jon Bogdanove and inked by Dennis Janke. SANCTUARY was written by Louise Simonson, pencilled by Kerry Gammil (for the Metropolis scenes) and Keith Giffen (for the scenes in Hell). Dennis Janke and Trevor Scott were the inkers, Bill Oakley the letterer and Glenn Whitmore the colorist. None of these stories had any reprint information available about them. I would also like to welcome two new podcasts to the Superman Family of Podcasts (there's no formal organization by that name. I just like to type it like that). - SUPERMAN IN THE BRONZE AGE, hosted by Charlie Niemeyer, contributor to the SUPERMAN HOMEPAGE website at http://supermanhomepage.com. 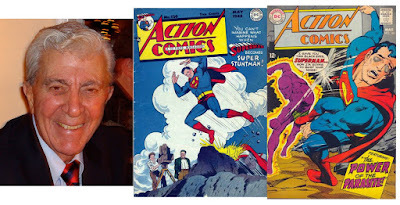 His weekly podcast reviews the Superman stories edited by Julius Schwartz, who served as Superman editor from 1970 - 1986. His podcast can be found at http://supermaninthebronzeage.com. - SUPERMAN FOREVER PODCAST, hosted by J. David Weter is a weekly podcast that covers classic and modern Superman in all media, along with the latest Superman news each week. It can be found at http://www.supermanforever.com. Episode #153: Superman: The Triangle Years! 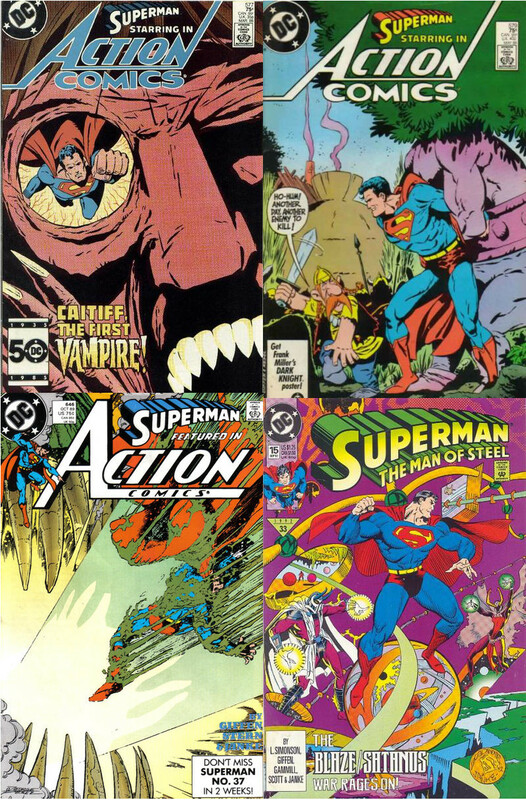 (Top L to R:) Superman 51, The Adventures Of Superman 474 & Action Comics 661, all cover dated January 1991! 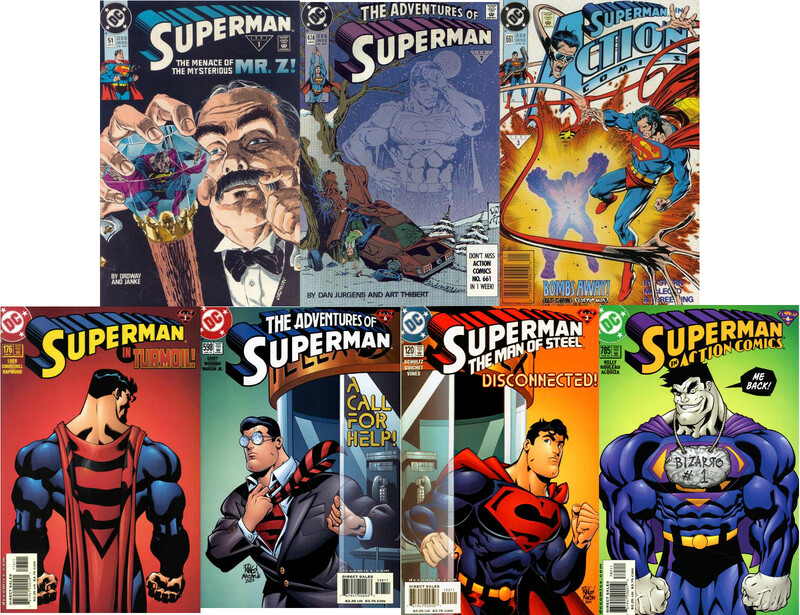 (Bottom L to R:) Superman 176, The Adventures Of Superman 598, Superman: The Man Of Steel 120 & Action Comics 785, all cover dated January 2002! Beginning this month in 1990, the Superman titles with the cover date of January 1991 carried an additional number under the masthead. Somewhere on the cover was a small triangle containing the year and another number. This was an aid to comic book readers in an era when the individual Superman titles were part of one overall storyline. A plot begun in SUPERMAN one month would continue in the other Superman titles with the same cover date. The triangle number assisted Superman fans in reading the issues in the correct order. With January of 1992, and each subsequent year, the triangle number would begin with a new number one. 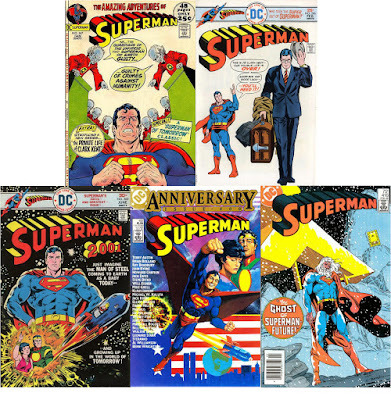 The Superman books cover dated January 1991, with the triangle number of 1991 numbers 1 - 3 were, SUPERMAN 51, THE ADVENTURES OF SUPERMAN 474 and ACTION COMICS 661. 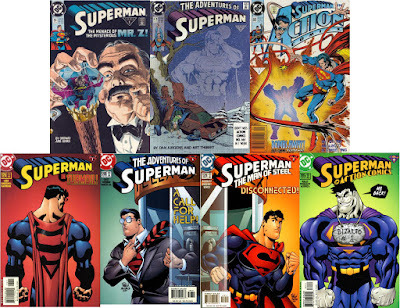 The triangle numbering continued through the Superman issues cover dated January 2002, SUPERMAN: THE MAN OF STEEL 120, SUPERMAN 176, THE ADVENTURES OF SUPERMAN 598 and ACTION COMICS 785. The Superman titles cover dated February 2002 and afterward would not carry the triangle numbering. They would not return until the recently concluded NEW KRYPTON storyline which involved all of the Superman related titles, with the exception of SUPERMAN / BATMAN, which were published 2009 - 2010. This episode also highlights some, but not all, of the major Superman storylines which were published during the triangle era. Most of them have been collected in trade paperbacks or other collected editions. Click on the GRAPHIC NOVEL link at DC Comics. You can also find these issues and their collected editions at used book stores, internet vendors such as http://www.instocktrades.com, http://www.mycomicshop.com, or the back issue bins of your local comic book shop. Next Issue: HAPPY BIRTHDAY, KEITH GIFFEN! Episode #152: Happy Birthday, Elliot S! Maggin! 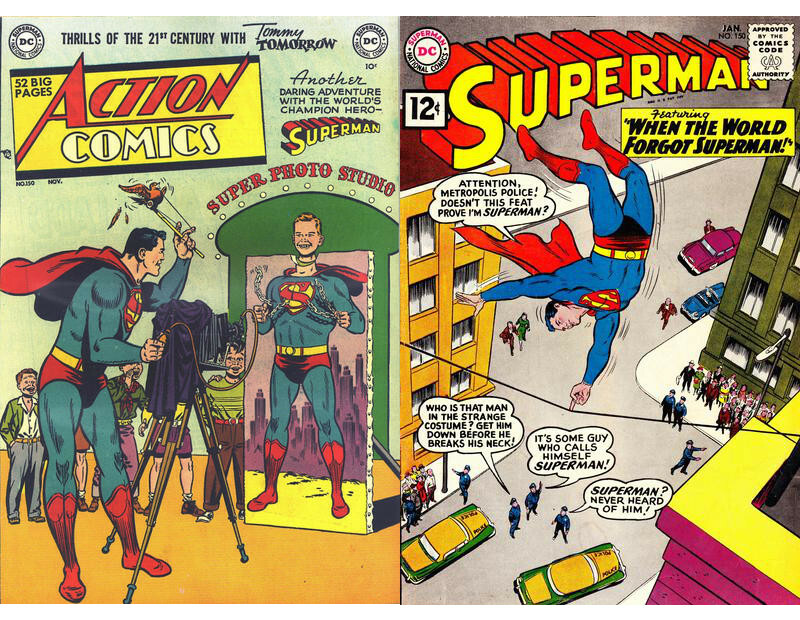 (Top L to R:) Superman 247, January 1972 & Superman 296, February 1976. (Bottom L: to R:) Superman 300, June 1976, Superman 400, October 1984 & Superman 416, February 1986! Elliot S! Maggin was born on November 15, 1950 in Brooklyn, New York. He is most well known for writing comic book stories for DC Comics in the 1970's and 1980's. The character he is most associated with is Superman, working for Superman editor Julius Schwartz. This episode explores his life and career and highlights some of his best Superman stories. During the episode, I failed to mention that he began to use the ! after his middle initial by accident. Because of the poor reproduction (compared to today) of comic books, he would end sentences with an ! instead of a period. He accidentally signed his script Elliot S! Maggin and it printed that way. Editor Julius Schwartz then declared that his name would always appear that way in his stories. To learn more about Elliot S! Maggin, you can go to http://superman.nu/esm/maggin.php . - MUST THERE BE A SUPERMAN from SUPERMAN 247, January 1972, published on November 11, 1971. This was Elliot's first published Superman story. It has been reprinted in THE GREATEST SUPERMAN STORIES EVER TOLD, SUPERMAN IN THE SEVENTIES, SUPERMAN: THE GREATEST STORIES EVER TOLD, vol. I & GREEN LANTERN: IN BRIGHTEST DAY. It can also be read online at http://superman.nu/tales2/yes/ . - WHO TOOK THE SUPER OUT OF SUPERMAN from SUPERMAN 296, February 1976. It began the four issue story involving Mr. Xavier, which involved a famous scene of Clark and Lois on a date, receiving news coverage, even. All four issues of this story can be read at http://superman.nu/tales2/whotook/about.php . - SUPERMAN 2001 from SUPERMAN 300, June 1976, published on March 11, 1976. It has been reprinted in SUPERMAN: PAST AND FUTURE. This story was featured in Episode 24 of this podcast. - THE LIVING LEGENDS OF SUPERMAN from SUPERMAN 400, October 1984, published on July 12, 1984. The stories in this issue were reprinted in SUPERMAN: THE GREATEST STORIES EVER TOLD, vol's. I & II. It can also be read online at http://theages.superman.nu/400/ . - THE EINSTEIN CONNECTION from SUPERMAN 416, February 1986, published on November 14, 1985. It was inked by comic book artist Al Williamson, the subject of Episode 13 . This story has been reprinted in SUPERMAN VS. LEX LUTHOR. ( During the episode I mistakenly guessed that it was reprinted in SUPERMAN IN THE EIGHTIES.) This story can also be read online at http://superman.nu/tales2/einstein/ and http://superman.nu/tales2/ghost/ . Next Episode: SUPERMAN: THE TRIANGLE YEARS! Episode #151: Action Comics #150 & Superman #150! Action Comics 150, November 1950 & Superman 150, January 1962! This episode continues a quarterly look at the issues of both ACTION COMICS and SUPERMAN. - Superman: THE SECRET OF THE 6 SUPERMAN STATUES, 12 pages, pencilled by Wayne Boring and inked by Stan Kaye. The writer was unknown. - Tommy Tomorrow: THE FORGOTTEN HEROES OF SPACE - an 8 page science fiction story, pencilled by Curt Swan and inked by John Fischetti. - Congo Bill: BARE HANDS - a 6 page adventure story, drawn by Ed Smalle. - Vigilante: SIX SLUGS FOR VIGILANTE - a 10 page modern western story, drawn by Dan Barry. - THE ONE MINUTE OF DOOM: a 9 page story written by Jerry Siegel and drawn by Al Plastino. - THE DUEL OVER SUPERMAN: a nine page story written by Robert Bernstein and drawn by Kurt Schaffenberger. - WHEN THE WORLD FORGOT SUPERMAN: an 8 page story written by Jerry Siegel, pencilled by Curt Swan and inked by Wayne Boring. Next Week: HAPPY BIRTHDAY, ELLIOT S! MAGGIN!